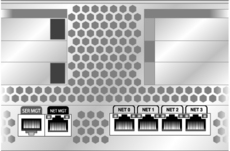 The server has four network connectors, marked NET0, NET1, NET2, and NET3. These connectors are RJ-45 Gigabit Ethernet. Connect a Category 5 cable from your network switch or hub to Ethernet Port 0 (NET0) on the rear of the chassis. NET0 is the farthest left port in the 4-port network cluster. Connect Category 5 cables from your network switch or hub to the remaining Ethernet ports (NET1, NET2, NET3), as needed.